Posted on April 9, 2014 by revivewa	in Faith in Action and tagged 2, feature, prayer. Three mates headed out to sea on Tuesday 4 February, not realising they were about to experience the ordeal of a lifetime. Stranded at sea for 16 hours, Rev Dr Les Brockway, Derrick Fayers and Anthony Solomons held on to hope through prayer and courage. The three men, aged 72, 78 and 60, set off from Woodman Point towards Carnac Island on one of their regular fishing trips, anchoring at around 6.00pm. They had already caught a number of fish when Tony hooked quite a large one and was determined to land it into the boat. Meanwhile, the back of the boat was gradually sinking lower and lower. Within a few minutes the trio were in serious trouble. “There seemed to be heaps of water in the bottom of the boat, all under cover. We were in big trouble!” Les said. “Tony cut his line and let the fish go. I got a small bucket and began bailing out the water. The bailing became frantic as we could not match the amount of water which was pouring over the transom area. With not enough time to grab equipment to notify emergency services and mobile phones waterlogged, the situation was dire. One thing which did save them however, was a length of rope which Derrick grabbed as the boat sank, which they used to tie themselves together. With the, now upside down, boat slowly becoming more submerged, they decided to swim to Carnac Island. But currents would prevent them from swimming on shore so they spent the night drifting – and praying. “We didn’t talk too much because when you opened your mouth to talk you would just as likely get a wave splash into your mouth, and you would be gulping salt water once again,” Les said. “We had seen the sun go down earlier in the evening just before the boat sank and flipped over. It was not too long before we enjoyed the moon and the stars, but after a few hours we saw the moon descending lower and lower towards the horizon. It was a sad moment to see the moon disappear beyond the horizon, but inevitably it did. It was as if a major beacon – almost a friend – had departed from us. “We kept checking on each other. Tony would say, “Are you okay Derrick”? “Yes, I am okay”, came the reply. “Are you okay Les”? “Yes, I’m okay”. Throughout the night, Les said that they always believed they would be saved. They felt God’s presence and knew they were not alone. 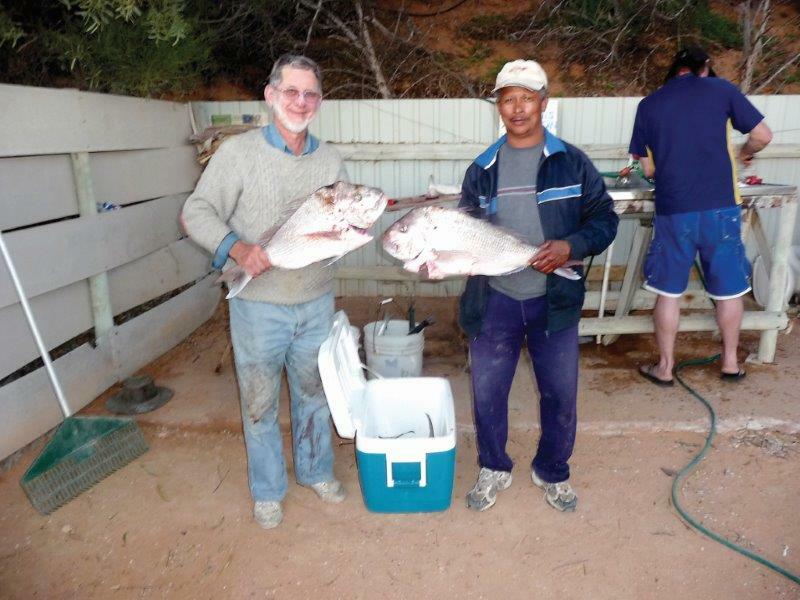 Rev Dr Les Brockway and Anthony Solomons after a previously succesful fishing trip. Even with the constant threat of sharks in the back of their minds, they stayed calm and waited. The three men were eventually rescued after Dirk Fayers, Derrick’s son, noticed them missing and alerted a rescue team, before being taken to Fremantle Hospital for treatment. With rescuers expecting to find three dead bodies, they couldn’t be happier. Top image: Rev Dr Les Brockway (second from left), Anthony Solomons and Derrick Fayers with their rescuers from the Westpac Surf Lifesaving Helicopter Rescue Service.